How to get there Both sides of the pass starts close to each other on the west side of the pass. The more southern approach from Morzine (976m) is twisty in open landscape with wide views and is logical choice if coming over the Col du Ranfolly (Col de Joux Plan) (1656m/1690m). 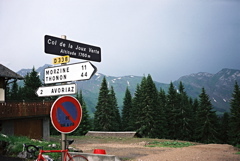 The more northern climb starts at Pont des Plagnettes (887m) or a bit further up at Montriond (945m), where the main road goes up the valley, but you could go up directly after the bridge or follow the road by the river. They all meet up a bit later on, but it could be a good idea to avoid the tunnel on the main road (unless it is raining). This side is straight ahead at the beginning with odd twists near the end in the woods. Other comments My climb to this pass started in Les Lindarets (1467m), but then I was coming down a bad gravel road from Col de Bassachaux (1781m). Les Lindarets has many bars and is a recreational area with lots of animals and is popular with families. You can continue the climb to the ski resort Avoriaz (1865m), which is also a BIG climb.